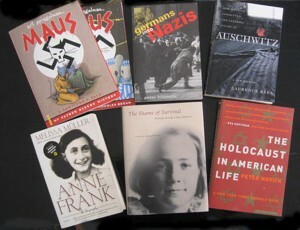 March 1, 2013: This course was just added today to be taught this Spring 2013 quarter. Since we are already in enrollment pass 2, I am going to relax the prerequisite requirement. 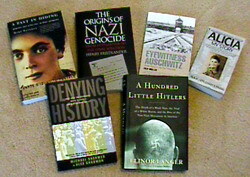 Some background in European, German or Holocaust history, such as another relevant course (including high school electives), or substantial independent reading, films, or museum visits would all count. 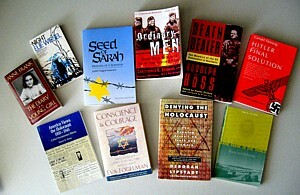 Or contact me by e-mail to discuss whether your preparation is sufficient: marcuse@history.ucsb.edu. Hist 133Q, "Readings in Holocaust History," is one of my favorite courses to teach, because we read the best books on a subject and discuss the issues they raise in great dept. I first taught this seminar in 1998, twice in 1999, then again in 2001, 2004, 2006 and 2008 (see the syllabi: 1998, 1999 winter, 1999 fall, 2001, 2004, 2006, 2008). In 2010 and 2012 I modified the course to work as a "133DR" course, in which student write an 18-20 page research paper to fulfill the History Department's capstone course requirement. In Spring 2013 I once again taught it as a 133Q course with short writing assignments, since the course was added just a few weeks before the quarter started. Basically, in this seminar of about 15-20 students, we read a book a week (long or thematically complex books are spread over 2 weeks). Each week teams of 2 or 3 students work with me preparing background material and help to lead the discussion, while other students either write a 2-page essay on a guiding question, or formulate 6-10 questions of their own. 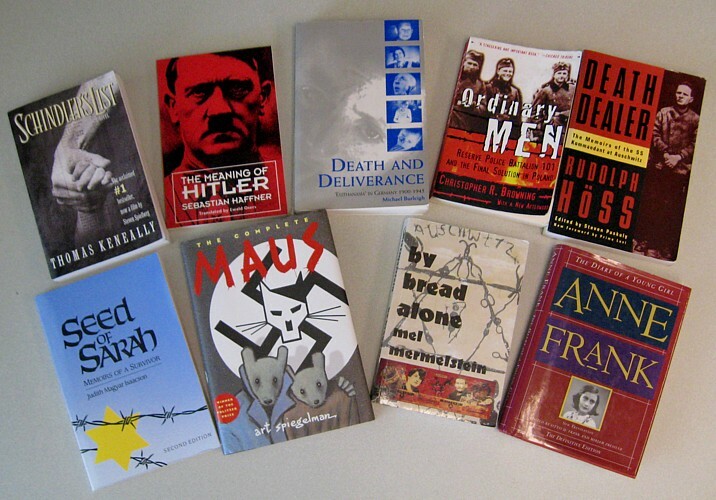 Each time I offer the course I keep some of the students' favorite books from the previous time, and usually choose a theme to guide the rest of the selection. 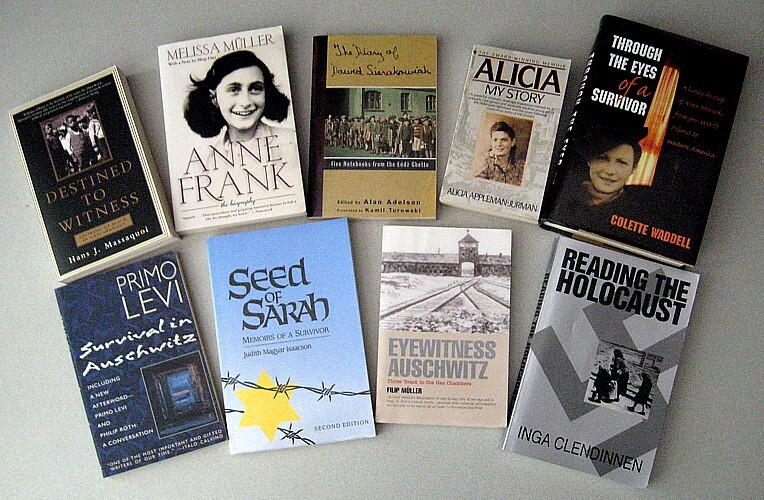 In the DR courses I tried to choose a broader range of books (multiple themes) to allow students more choice in selecting their research paper projects. 1999-Winter (Winter 1999 syllabus) . note to self after the course: I think the student-led discussions didn't work as well this year, so I think next time I'll go back to leading the first hour myself. This year I began teaching this readings seminar as one of our new DR "Directed Readings" courses, an intensive seminar that fulfills the same upper division History major requirement as the Proseminar courses, except that the term paper need not be based on original research. I tried to organize the students into groups to work on web-based projects clustering around each of the weekly reading topics, but that didn't quite work out. 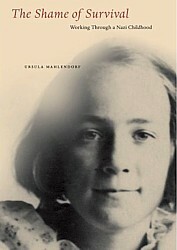 Our guest speaker this quarter was Prof. Emerita Ursula Mahlendorf, author of The Shame of Survival. 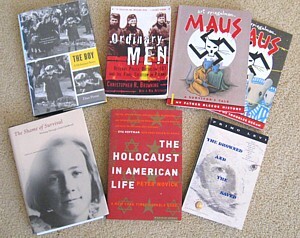 Novick's The Holocaust in American Life. 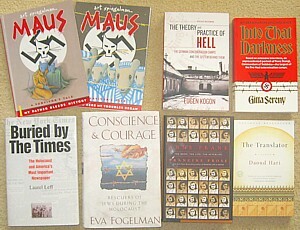 paper, and each book represented a broad theme, instead of all books treating aspects of a single theme. It's not a real oral exam, I just want to hear from you some reflections about what you got out of the course, what questions still remain, and maybe what your future plans are and such like. As I said, the author is completely accurate in what he says about me & those items from my website. He is trying to argue (I think), that I contribute to making Germans feel guilty about the Holocaust, so they don't make as many babies. Go figure. The segment about my site starts about 2 mins. into the 7:27 episode #30. For an impression of the bizarre logic of today's deniers, sample a clip or two. Segment 13, for instance, examines Sobibor, and uses Thomas Blatt's model of the camp as "evidence" for this denier's pseudo-argument. (The explanation to his rhetorical argument in that segment is that those 80,000 bodies--buried across that whole area of the camp--were dug up in 1942-43 and cremated, and the "mass graves" of the camp phase documented by the map and model are graves of the ash remaining from the partially decomposed corpses burned on outdoor grates. Oct. 28, 2009: It is important to note that we will have DIFFERENT READINGS for the 2010 course offering, which will also be a "DR" (directed readings) course, and thus organized somewhat differently with a different writing assignment. See course description, below. So: do not buy the books for this course yet! 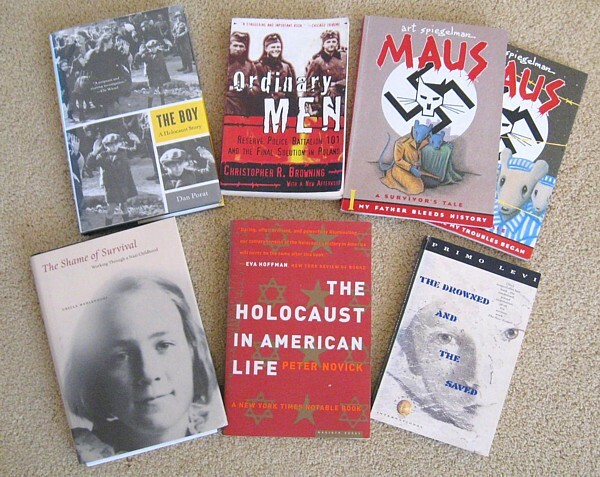 See also my Hist 133D course website: My Hist 133D and 133DR courses are closely linked: in 133D we will read two paperbacks (Fritzsche's Germans into Nazis, and vols I+II of Maus) in addition to the textbook and essays in the course reader. Both of those paperbacks are also part of the readings for 133DR, and several texts in the 133D course reader are chapters from the other books for 133DR. Thus the workload for 133DR is much less for students already in Hist 133D. 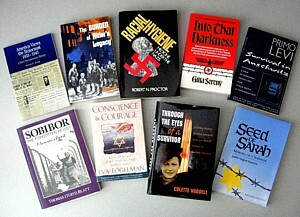 Jan. 4, 2010: The 2010 syllabus is now available: pdf of syllabus. Jan. 5, 2010: The course is now full, and I'm not even able to take students who are already in Hist 133D, sorry. 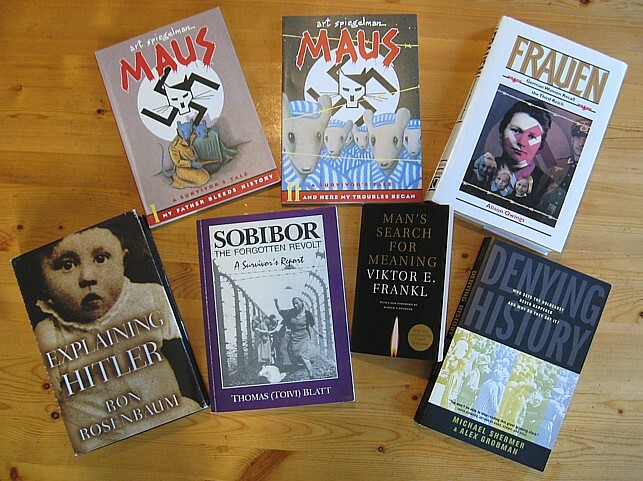 For Monday 1/11: read Maus and submit your reading notes on the course GauchoSpace site by 10am that day. This page of Maus resources may be helpful to peruse. 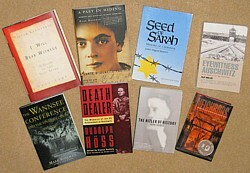 Jan 12, 2010: book photo in header updated. I know (hope) you are busy with the Anne Frank biography for tomorrow, but I'd like to invite you to what promises to be a fascinating lecture on Tuesday. Hasan Nuhanovic is visiting California for a lecture in the UCLA Human Rights Colloquium Series and joins us at UCSB to give a talk on the events surrounding the fall and genocide of the town of Srebrenica in eastern Bosnia in July 1995. Nuhanovic is a Bosnian Muslim who worked as a translator for the United Nations. As such he worked very closely with the Dutch Battalion (DutchBat3) tasked with protecting the unarmed population of Srebrenica. His mother, father and brother were all killed in the genocide after the Dutch Battalion refused to grant them, or any other civilians refuge within the UN compound, as mass executions by the Serbian forces were taking place. Mr. Nuhanovic's book, Under the U.N. 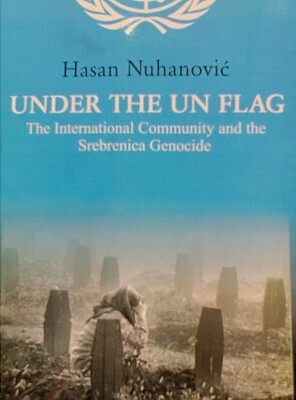 Flag: The International Community and the Genocide in Srebrenica (2007; amazon.uk page) offers the first publicly available account of the terror and inhumanity experienced by those seeking sanctuary from genocide who placed their lives and their trust in the hands of the peacekeepers. Unarmed, starved and deprived of basic human needs the people of the 'safe haven' of Srebrenica placed their complete reliance on the promise of protection by the United Nations. This book is compiled from firsthand experience of the events by Hasan Nuhanovic as well as other survivors of the genocide. It provides a detailed chronology covering the days leading up to the notorious days in July 1995 when the genocide of Bosnian Muslims in Srebrenica began and the subsequent period during which the world media continued to propagate the message that nothing sinister was going on: it took the best part of six years before genocide was officially deemed to have taken place in 2001. 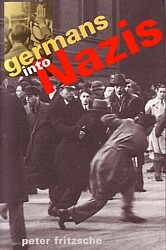 This unique account is both an exhilarating read and a major work of historical reference. You can find some interesting links, including video of Mr Nuhanovic, on this Genocide Event page. a list of some primary source materials and secondary literature you will examine.